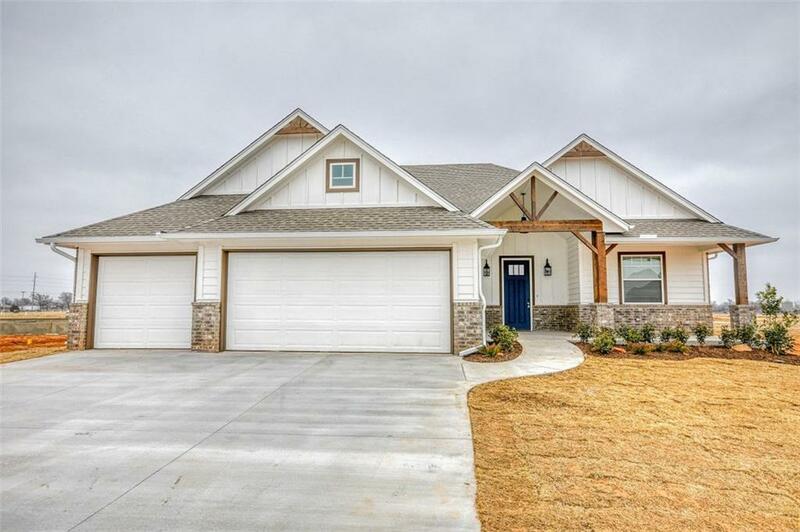 Looking for the ultimate craftsman farmhouse right here in Norman? Luxury greets you on the front porch with designer light fixtures, patio lighting and a gorgeous 8' door! The designer hardware fills the home and creates the ultimate farmhouse look in the open kitchen with farmhouse sink. Additional storage is located in the island & the pot filler is the perfect addition to your gourmet kitchen. The master suite has accent lighting in the tray ceiling, shiplap accents and a free standing tub. The shower is spacious and grand with one of a kind tile. Master suite connects the laundry room where you find designer tile accents. The cosmetic features are lavish but the sprinkler system, soft close cabinets, dimmer switches, custom barn door, retrofit can lighting, tankless water heater are what make this home one of a kind. Directions: Take Hwy 9 East. South on 12th. South to Cedar Lane. Cedar Lane East to Addison. Right on Addison. Right on Skyler. Take Skyler to Andrew Ct.